Andrew Loftus ('97 B.S.) 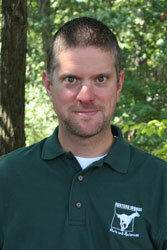 serves as assistant principal of Hunters Woods Elementary School for the Arts and Sciences in Reston, VA. He was the elementary music teacher at the same Fairfax County school prior to his move to administration. Andrew holds an M.A. in Teaching from George Mason University, and received his administrative certificate from the University of Virginia in 2010. During his time at Penn State, he was a trombone student of Mark Lusk. Provided by his parents, the Andrew Ward Loftus Scholarship provides recognition and financial assistance to outstanding undergraduate students pursuing a degree in Music Education who have a superior academic record and who play the trombone, euphonium, or tuba. Hunters Woods Elementary is one of 16 member schools of the Kennedy Center's Changing Education Through the Arts (CETA) program. The school's partnership with the John F. Kennedy Center for the Performing Arts, which began in 1999, helps teachers develop their expertise in integrating the arts with the teaching of other school subjects (such as history, language arts, science). The focus on arts-integrated instruction is designed to help all students learn with greater motivation and ease. The Kennedy Center and the schools work together to develop, implement, and evaluate staff development programs which include course work, workshops, coaching, and study groups. Since 2009, Hunters Woods has also collaborated with George Mason University's Potomac Arts Academy and the Southgate Community Center in a "Saturday School" program which provides weekly sessions in visual arts, music, theater, and science to 4-6th graders. The program invites between 40-50 students each winter to participate. Andrew was quoted in a recent article regarding the school's particpation in the Saturday School program. To read the full article, please click here.